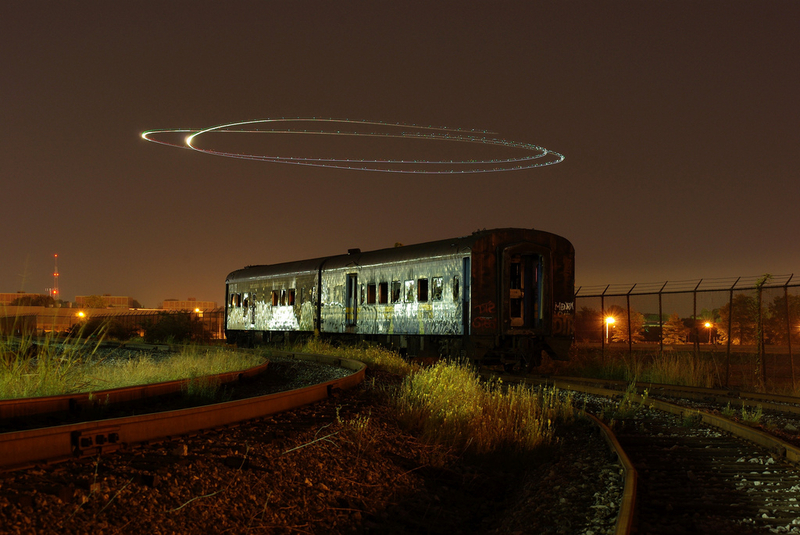 Nice shot of an old subway car old passenger cars in Baltimore with a halo that is actually a helicopter captured with a long 98.5-second exposure. But they’re not subway cars. They’re regular passenger railroad cars. Long-haul cars by the look of it. The one closer to the camera is in VIA Rail Canada (Canada’s version of Amtrak) livery from the mid-1980s (dark blue with two yellow stripes on the lower part of the car). After the 1991 cuts, they had quite a few surplus cars. The one further away is painted with the text “British Columbia Railway” at the top. Furthermore, there is no third rail visible on the track to qualify the rail car as a subway car.